More than striking power or a black belt in jiu-jitsu, the most important aspect of any successful mixed martial artist’s arsenal may be a short memory. Just ask Ronaldo “Jacare” Souza whether he spent any sleepless nights waiting to avenge his 2008 loss to Gegard Mousasi, an opportunity that arrives this Friday in Mashantucket when the two middleweights meet in the UFC Fight Night main event. It should be, with Souza sporting a six-fight winning streak and Mousasi winning five of his last six. Both also sit in the 185-pound top ten, the Brazilian at number four, while the Netherlands’ Mousasi is in the number seven slot. The fighters also share the status of being former Strikeforce champions, and if you’re looking at the stylistic matchup, Souza is a world-class groundfighter who has discovered power in his hands, and Mousasi is a precision striker whose last two finishes against Mark Munoz and Mike Pyle have come by way of submission. Yeah, if you’re looking for an evenly matched bout between two of the best in the world, this is the fight you’ll want to watch on Friday. Yet despite their first bout taking place nearly six years ago, it does warrant a look back, especially since most folks forget that when Mousasi won the 2008 DREAM Middleweight Grand Prix final in Japan by finishing Souza with an upkick, it wasn’t each fighter’s first bout that night. “It was a long, long time ago, but I remember that in the first fight (against Zelg Galesic) I got a really beautiful and quick submission, an armbar, and Mousasi submitted his opponent real quick as well, and we had to fight in the next bout,” Souza recalled. In Saitama, Souza needed just 87 seconds to finish off Zelg Galesic, and Mousasi 88 ticks of the clock to submit Melvin Manhoef. The first meeting between Souza and Mousasi didn’t last much longer – 2:15 to be exact – but it was Mousasi emerging with the win. Both fighters moved on from the bout with great success, but it was the development of Souza’s game that caught the most attention. 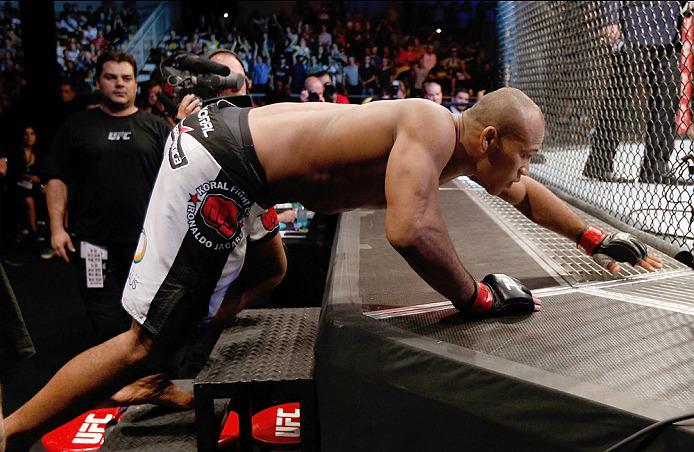 Simply put, when an athlete is so good at one aspect of his game, like Jacare is with his jiu-jitsu, there isn’t an urgency to bring the other parts up to that same level. The 34-year-old from Rio de Janeiro didn’t agree with what other fighters believe, opting instead to focus his efforts on being able to win fights wherever they take place. “MMA is quite new for me, and it’s so challenging because you need to oversee thousands of details and many different types of fighting,” he said. “Different kicks, different punches, wrestling defenses. And that motivates me a lot. I learn every day and that makes it fresh for me. Beginning with his 41-second knockout of Derek Brunson in Strikeforce and continuing with his UFC stoppage of iron-chinned Yushin Okami, Souza is proving to be a rough matchup for anyone he faces in the Octagon, and right on time, as a win over Mousasi would not only even the score between the two, but would also mark his seventh consecutive victory and presumably put him in line for a shot at the middleweight title. “I don’t know the UFC’s plans, but if you look at the UFC’s rankings, it makes a lot of sense,” Souza agrees, but when asked who he would prefer to fight, champion Chris Weidman or the man challenging for the belt in December, Vitor Belfort, Jacare decides to be Switzerland. “I prefer to fight the champion,” he smiles. But when told he has a career in politics after his fighting career is over, he laughs.